Like I said in my last post we have a chess table with new pieces. We have actually used it quite a bit since we got it and a few days ago my Dad came up with a variation of chess which he called ‘soccer chess’. Later on we changed the name to ‘stress chess’ because ‘soccer chess‘ already exists. 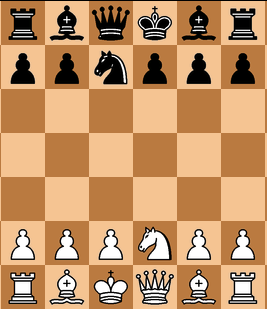 ‘Stress chess’ is played on a 6 x 7 board and is set up the same way except that there is only one knight who starts in front of the queen. The only rule that is different from regular chess is that the pawns can only move one space forward on their first move. What makes this game stressful, you ask? You only have 10 seconds to make a move or your other timer, which has 90 seconds, starts ticking. If your 90-second timer reaches zero you forfeit the game. You also lose the game if you have no legal moves, so there is no stalemate. I’ll give you a few tips which you can choose to follow (I haven’t managed to beat my Dad yet). Pawns are quite valuable; since the board is so short, they reach the other side often and are promoted. Don’t be afraid to let your 90 second clock tick a little bit because otherwise you might rush into making a rash move that could mess up the whole game for you. I would also suggest that you be very careful with your knight, especially since there is only one. Watch out for the two-move checkmate. If you have any questions please leave them in the comments and I will try to answer them.